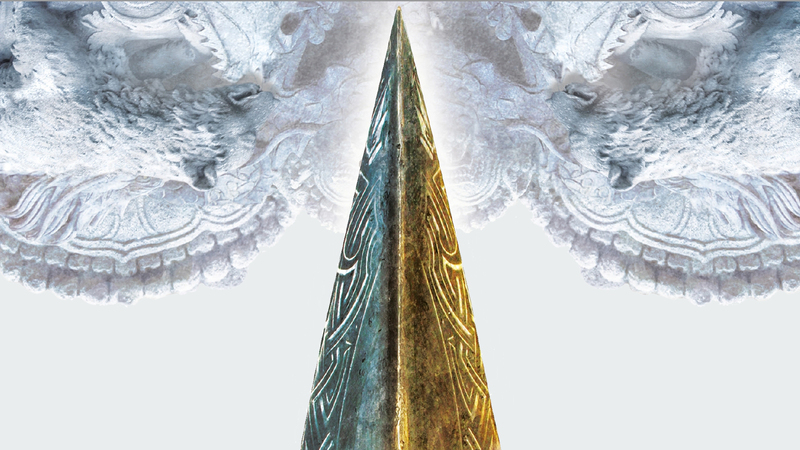 To dig deeper into the epic fantasy series The Faithful and the Fallen, including Malice, Valour, Ruin and the final conclusion Wrath, we asked author John Gwynne 5 questions about everything from writing, to his inspiration and his favourite moments. Our FAVOURITE author photo (below) is the one of you on your 'throne', resplendent with giant ax and huge dogs! Can you tell us the story of how that photo came to be? It’s really lovely to hear that. The photo session was a lot of fun, and there are plenty more, featuring the whole Gwynne Clan. Really it was just a moment of madness. My family and I are all fans of ancient history and we’ve spent a lot of time visiting castles and historic sites. We’re also very fortunate in that Europe’s biggest Medieval Festival happens every year right on our doorstep, at Herstmonceux Castle. That’s where our inspiration came from really. We’d all love to be re-enactors, but life with my daughter Harriett, who is profoundly disabled, can limit that somewhat, so we limit ourselves to visiting local castles and events, and compensated with the photo shoot that my author photo came from. It was a great afternoon of fun-in-the-sun, the photos taken by one of my oldest mates and a budding amateur photographer, Andrew Campbell. Everyone got into the spirit of it very easily - there was almost a beheading, but I won’t talk about that. The dogs loved it, too. Trinity, the Akita that looks like a wolf, was my original inspiration for Storm in my books - a more loyal and faithful hound you’d never find. Your books feel as much historical as fantastical in some ways, with a genuine sense of actual myth and legend having been woven through them. What are the historical and fantastical influences behind the Faithful and the Fallen series? I did a lot of research before I started writing The Faithful and the Fallen. The only way I knew how to write was how I’d learned at University, with the golden rule being to read, read, and then read some more. So I did. Ancient history and mythology were really the corner stones of The Banished Lands and the peoples and creatures inhabiting it. Very early on in my reading I was drawn to Caesar’s Gallic War, the Roman invasion of Briton, Boudicca’s revolt, as well as Celtic and Norse mythology. I wanted my world to feel almost like an alternative ancient Europe, one where the line between history and myth was blurred, a world where the mythical tribes of giants that inhabited Briton were a reality, not God’s, but Clans, people with their own agendas, loves, hates, dreams and fears. I hoped that the history and mythology would seep through and give my characters and plot a grounded sense of history and reality. What have been the main challenges in terms of writing this book three? Well, keeping tabs on the growing cast list was an issue! My own fault, I know. And every character has their own history within the story, their own battle scars - literal and metaphorical - that have to be remembered and built upon. You can’t have a character take an arrow in the shoulder at the end of one book only to come out immediately swinging his sword in the next. Fortunately, some major POV’s die in this one, (or unfortunately, depending on what you think of the characters!) so that makes it a little easier to keep tabs on the living! Juggling character, plot and pace is always difficult. I try to tie character building in with events, so that both are happening simultaneously, keeping the plot moving forward and the characters growing. As you've been through the mill of two books now, you're a debut author no more. What do you think you've learnt as a writer that you've been able to bring to this book? Crikey, I still think of myself as winging it! Thinking back on it I have learnt a lot - working with the amazing editors and team at Tor UK there’d have to be something wrong with me if I hadn’t learned anything from that wealth of talent. What's your favourite dramatic moment in the book? So here are a few scenes that I especially enjoyed writing, and which evoked a strong response from Ed. I really enjoyed writing the battle sequence at Gramm’s Hold, where a few POVs converged at the same time, and some giant bears got in on the act. Ed liked that one. Also, there’s a scene before the gates of Drassil, a duel, that I really enjoyed writing and that Ed seemed to enjoy. He was re-enacting moves upon his younger brother Will, anyway. Like I said, I’m really bad at choosing favourite moments! I guess I’ll have to wait and see what readers think about that question. The epic conclusion of The Faithful and the Fallen series, Wrath, is also out now in Paperback and as an Ebook! It’s time to brave the final battle . . The Faithful and the Fallen quartet is made up of Malice, Valour and Ruin, followed by the epic conclusion Wrath.